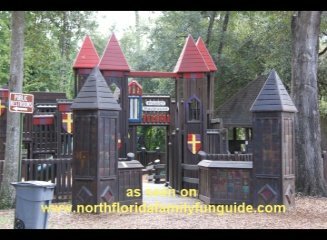 Wonderful shaded community built wooden playground beneath a canopy of live oak trees, a covered pavilion, walking trails, butterfly garden, and more are here at Clarke House Park in Orange Park. The expansive wooden playground structure was designed in the shape of a castle, and it's beautiful! Children's hand prints with their names proudly attached decorate the tiles at the entrance. Parents and grandparents names were proudly imprinted on the wooden slats making up the perimeter fence. There is a giant wooden airplane, and a giant wooden ship for kids to climb on. They also have a puppet theater, a separate area for young children, and more! We appreciated the covered pavilion so close by, that had two vending machines full of drinks and snacks. That was so thoughtful! There are also electrical outlets on poles to accommodate the many uses that this park enjoys. They have several large community festivals at this location throughout the year. Three times a year the Clarke House, an old farmhouse built over 100 years ago, is opened for tours. They are in the process of refurbishing the museum to provide for tours on a regular basis. The Boy Scouts recently built a raised wooden walkway in the butterfly garden with a wooden bench overlooking the pond on the other side of the fence. The Orange Park Women's Club built the beautiful butterfly garden. There is a walking trail through the woods about 1/2 mile long, for the adventurous. We enjoyed our time here and hope you get the chance to visit soon!